Ellen Loo & Co is a licensed Company Auditor based in Kuala Lumpur. Contact them to find out more of range of financial services that they provide. Bringing into consideration all the relevant factors i believe that Ellen Loo & Co deserves all the five stars for all the above categories. 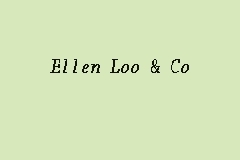 Ellen Loo & Co is a member of the professional body Malaysian Institute of Accounts (MIA).